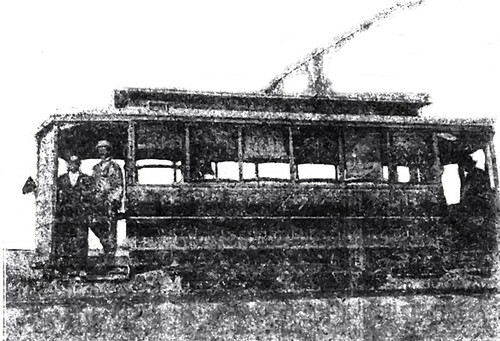 Only relics, rusting pieces of steel, and the rare preserved object remain of the great interurban railway that once connected the cities and towns of the Tri-State area. While we intend to go much further into depth on the railway, for now we’re going to provide a glimpse of it. 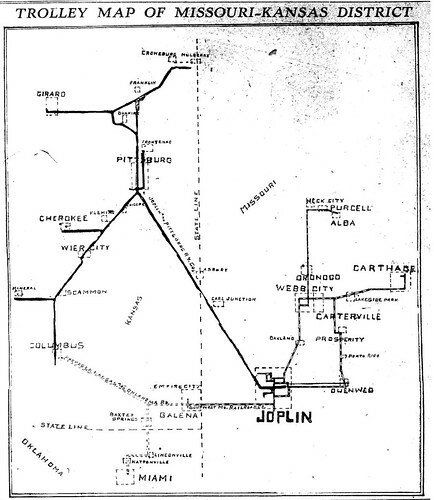 Below is a map from 1911 showing the steel web of connections of the Southwest Missouri Railway. An article from the Joplin News Herald proudly boasted that the railway was one of the first of its kind, beginning service in 1893 with a 10 mile long connection between Joplin, Cartersville, Webb City and Prosperity. Nearly two decades later, the railway had accumulated 75 miles of track and was accessible to over a 100,000 residents of the area. In 1894, the railway was used by 400,000 travelers, a number that grew to an astronomical 8,000,000 by 1910. Initially served by small cars, like the one pictured below, by 1911, larger trolleys were in service powered by four 50 horsepower engines. Cars ran every half hour between the towns with the exception of Joplin to Carterville, 15 minutes, and Joplin to Webb City, every 10 minutes. The costs ran anywhere from 1 penny to 1 1/2 cents per mile. A very low and reasonable rate, the article in the News Herald added. Car No. 3 was powered by two 25 horsepower engines. 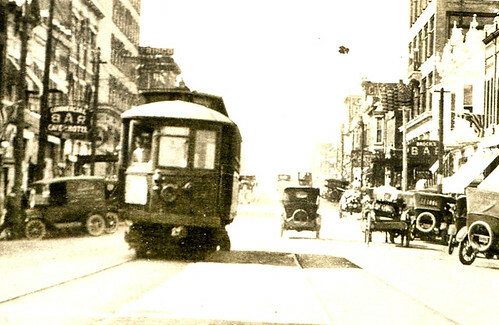 Street Cars used to be found traveling up and down the major streets of Joplin and connected the city to the surrounding communities. For those of you who would like to experience the real thing, you can catch a ride on the “Polar Express” up in Webb City this coming weekend at King Jack Park. A year long resident of the park, the street car is literally rolled out from time to time for the joy of taking a ride on her. You can watch the street car carry ticket holders from last week from 1 to 3 pm, or grab a free ticket and take a ride from 3 to 6pm. Don’t miss this chance to experience a bit of the past! This page took 0.643 seconds of computer labor to produce.